HOA Calls all Pastime Friends, Classmates, Teachers and Journalists to Join! HOA Calls You to Be Active, Politically! The HOA Calls you and all pastime classmates, journalists and teachers. We cal all colleagues, friends, lovers and interested HOA citizens to join the Horn Africas Network, create, write about the political development in the Horn of Africa, discuss the political problems, write to each other and create and share the network. 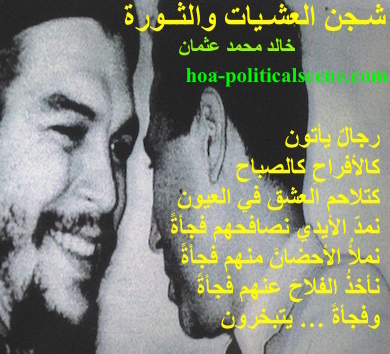 hoa-politicalscene.com - HOA Calls: Couplet of political poetry from "Evening Yearning and Revolution", by poet and #journalist #Khalid #Mohammed #Osman designed on Che Guevara and Ahmed Ben Bella. This page on the HOA Political Scene is only for people from the HOA, whether they live in any of the miserable lands in the Horn of Africa, or abroad. Read the HOA geopolitical abbreviation. 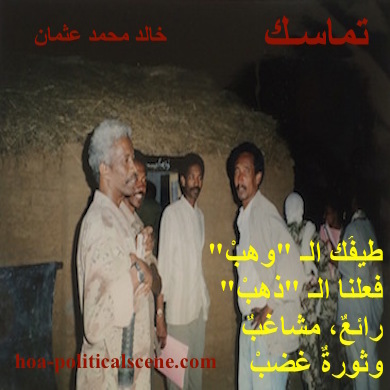 hoa-politicalscene.com - HOA Calls: Couplet of political poetry from "Consistency", by #poet and #journalist #Khalid #Mohammed #Osman designed on the #Sudanese revolution fighters. As you see from the scripture of the HOAs political poetry on the HOAs images and below them, you could get the impression that we'll never develop the area, without having to look deeply inside the political problems to solve them. We should get together to do this. 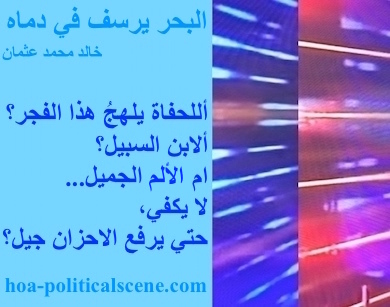 hoa-politicalscene.com - HOA Calls: Couplet of political poetry from "Dancing in the #Fancy of Roses and Lemon", by #poet and #journalist #Khalid #Mohammed #Osman designed on the Sudanese Theatre. So, the calls of HOA are intended to get you active, not only politically, but also literary to raise an awareness and to make the citizen of HOA sure of the secular concept of the state, as it is the only solution to get the area out of religious dilemma. As you see from the HOAs animation gallery, the HOAs design gallery, the HOAs gallery and the HOAs imagery poems that our involvement cover the literary area, because it is important to erase the political absenteeism created by leaders of sects and religous militias almost in many states in the Horn of Africa and East Africa. 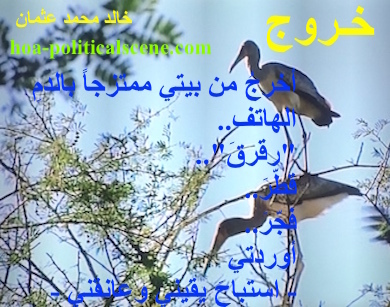 hoa-politicalscene.com - HOA Calls: Couplet of political poetry from "Exodus", by #poet and #journalist #Khalid #Mohammed #Osman designed on the #Sudanese Dinder and Rahad reserve. 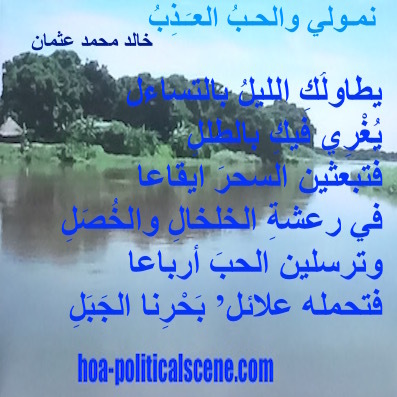 The Sudan is only an example you see through the poetry snippets on those pages and at the HOAs literary works, the HOAs literature, the HOAs love poems, the HOAs photo gallery and the HOAs picture gallery. 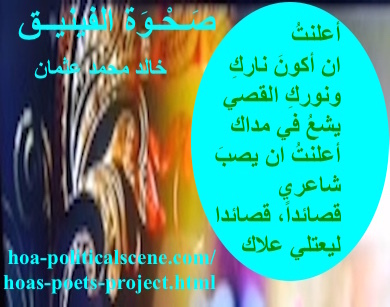 hoa-politicalscene.com - HOA Calls: Couplet of political poetry from "The #Sea Fetters in Its Blood", by #poet and #journalist #Khalid #Mohammed #Osman designed on rotated left aqua rectangle. Even love, as you see through love poems on the HOA Political Scene Blog will never be perfect in such environment controlled by military dictators and the religious madness of sects. hoa-politicalscene.com - HOA Calls: from "The Sea Fetters in Its Blood", by #poet & #journalist #Khalid #Mohammed #Osman designed on beautiful image with blueberry. Same couplet, as above. The sects have been developed through the fiftieth to make the population politically absentees and caused the military coups, while the religious madness continues to develop religious militias, such as you see in Sudan and Somalia. 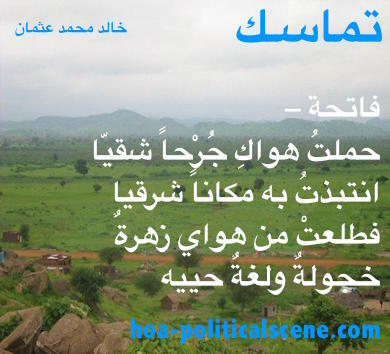 hoa-politicalscene.com - HOA Calls: Couplet of political poetry from "Consistency", by #poet and #journalist #Khalid #Mohammed #Osman designed on green valleys, eastern Sudan. How to respond to the HOA Calls and be active politically? If you liked the message of the Horn of Africa's Network, don't just read and appreciate the efforts we make to put political things into their right place. hoa-politicalscene.com - HOA Calls: Couplet of political poetry from "New Adam", by #poet and #journalist #Khalid #Mohammed #Osman designed on beautiful image with clover rectangle. Do more than that through the activity pages on this network outlined here within. It is more better than taking thee actions in the social media. Because you don't own the social media. But, you will absolutely own your pages here. In addition, the social media will never serve your political social goals. We serve these goals and we don't have any kind of censorship. 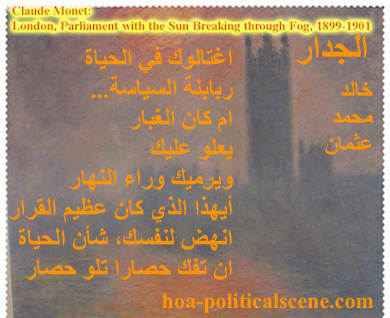 hoa-politicalscene.com - HOA Calls: from "The Wall", by poet and journalist Khalid Mohammed Osman designed on Claude Monet's painting "London Parliament, with the Sun Breaking Through Fog", 1901. There are also many differences, such as that you will get it easier when working with people you know and trust in the network, when all the goals of HOA Calls are met and we gather the socialist people we want to make this network strong. Political engagement in the HOA Calls is basic element in the HOA Network and it has two different language platforms. The starting pages are the HOAs Comprehensive Projects, USHA and the USHA Framework. 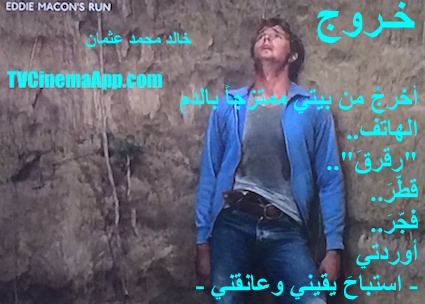 The Arabic platform is at the Arabic HOA Political Scene. hoa-politicalscene.com - HOA Calls: from "Exodus", by poet Khalid Osman designed on a picture from Eddie Macon's Run at the time Eddie escaped from prison. Same couplet, as in the fifth picture. Read the main pages linked above with some other political pages with the updates at the HOA Political Scene Blog and the Arabic version of the blog. Then, if you liked the topics we cover, comment on them, forward them to concerned friends and keep visiting the network. 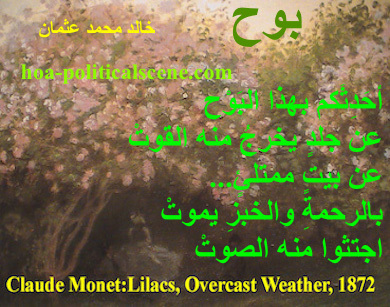 hoa-politicalscene.com - HOA Calls: from "Revelation", by poet Khalid Osman designed on Claude Monet's painting "Lilacs Overcast Weather", 1872. To enrich this medium concerning the HOA Calls, there are variety of cultural activities to open the minds of the natives in many states in East Africa and the Horn of Africa and to erase the political misconception and to manage the situation of static minds of "politically absentees". 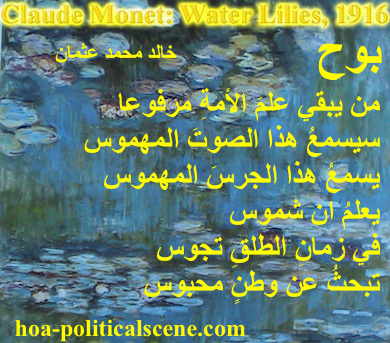 hoa-politicalscene.com - HOA Calls: from "Revelation", by poet Khalid Osman designed on Claude Monet's painting "Water Lilies", 1916. As you see through the HOA Calls, the pages are for artists, journalists, literates and poets. The pages for literates are at the HOAs Cultural Project. 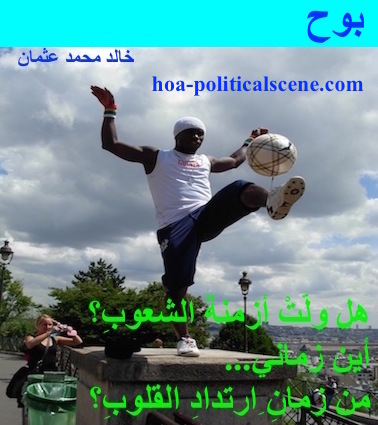 hoa-politicalscene.com - HOA Calls: from "Revelation", by poet Khalid Osman designed on street sport scene, Paris, France. 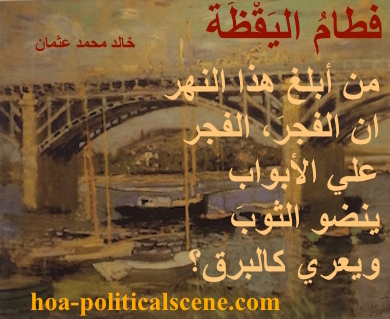 hoa-politicalscene.com - HOA Calls: from "Weaning of Vigilance", by poet Khalid Osman designed on Claude Monet's painting "The Seine Bridge at Argenteuil", 1874. My goodness, I really am so impressive and I get some more impressions when I reread my own poem. I assure you, without any assumption, no one in my language can write such poetic expressions. Just imagine, how could the "dawn" come at the doors? How could the "dawn" strip? and not just strip, but strip like lightning? How could the sky lightning strip? Pictures! It is all about pictures and the way you interpret pictures in your mind and in your memory. When you call these pictures, let them dance even surrealistically. That is art in poetry. And, it is my own poetry school and my own poetry movement. Follow it and expose it. 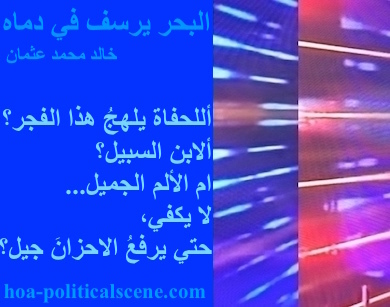 hoa-politicalscene.com - HOA Calls: from "The Prophet", by poet and journalist Khalid Mohammed Osman designed on beautiful coloured image. The journalists pages are at the HOAs Journalists, HOAs Journalists project and Horn Africa's Journalists. The poets pages are at the HOAs Poets, the HOAs Poets Bookshop, the HOAs Poets Project and the Squadron of Poets. How to respond to the HOA Calls and be active literary? Read the Arabic and English versions of the literary pages and contribute providing your ideas and writing about your own literary works. You can provide literary works too to be included in the literary network and then forward your production to your friends through Forward HOA PoliticalScene to join in and share the network you create. 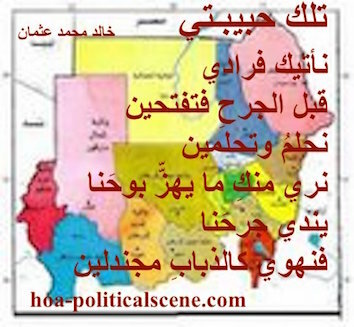 hoa-politicalscene.com - HOA Calls: from "That's My Love", by poet Khalid Osman designed on incomplete Sudan map. That's not the Sudan we know. The Sudan we know is 1000000 square mile land. You may get many ideas from the poetry you read on the pictures associated with the HOA Calls. For more similar pictures with snippets of poetry from my poetry collection, see the HOAs Photo Gallery. We have more than 1000 pictures in this production line you can print out from the HOA Calls and the other pages to decorate your room, share with friends, hang on locations on your city and fix them on your automobile. hoa-politicalscene.com - HOA Calls: from "Rising of the Phoenix", by poet and journalist Khalid Mohammed Osman on beautiful design with turquoise oval. That seems like my love, I am singing for on this poem, with the same title that takes the title of the poetry collection, is not a female, but the modern secular state. HOA calls all those socialist people in Djibouti, Eritrea, Ethiopia, Kenya, Somalia, Sudan and Uganda, or from these states but they live in some countries in the Diaspora. If you feel they are not doing well concerning politics, you can however, use the forms in the relevant pages to write about that. In the other hand, when you get into this website through the HOA's Calls, or other pages be active and keep in touch with this website by becoming a friend at the Horn of Africa's Friends. Use the form to register basic information and be sure that this is so confidential. In addition, you have the HOA PoliticalScene Newsletter archives at the following pages to get back to the history of this network and the political issues we have published until now from the HOA Political Scene 23 to the HOA Political Scene 51. Make this page your home page following these steps: Open Internet Tools in your Internet browser window and scroll in the small window to the last written words there that read as "Option". You will find a link there already highlighted. Copy this link https://www.hoa-politicalscene.com/hoa-calls.html, paste it there and click OK.
Take the free version of the picture book and rate it on the iTunes at Rising Phoenix Picture Book. Use the following form to write HOA News, comments, articles about those countries or just to respond to the call and connect with the network. You can invite your friends to this page too when you Forward HOA Political Scene to them and encourage them to discuss political issues with you here. Comments on this page appear at the section of it above and below the comments form.